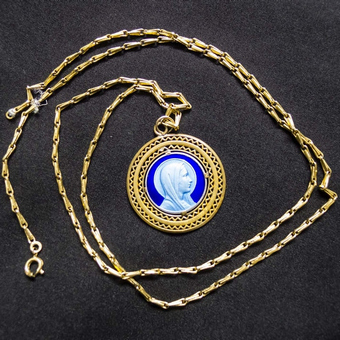 Maria's chosen object was a medal; a last gift bought for her in Lourdes by one of her daughters. The multiplicity of twigs in the artwork reference the collecting habits of her granddaughter. 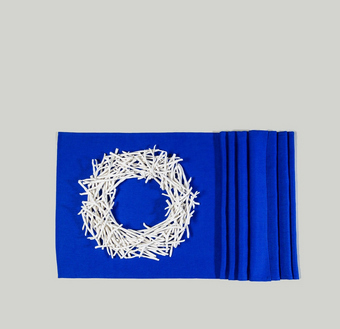 Their circular arrangement reflects the shape of the medal, and the blue linen cloth echoes its enamelled colour. The white twigs, which resemble cuttings ready to be planted, suggest new growth, while their circular configuration references a nest or the cycle of life - if, however, the work is interpreted through Christian iconography, the twigs may also imply pain and suffering. Both elements of the work can be rearranged to express a diversity of meanings and interpretations.